For a corporate headquarters in downtown St. Petersburg, Florida. Robert Neff collaborated with an Interior Design Firm and Gallery to define space and design objectives. The contemporary wall art decor includes artist proofs, contemporary art prints and original contemporary art for sale. The art work is large format contemporary art. abstract art and photography. 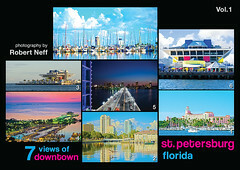 Browse through artist Robert Neff's commissioned photography and abstract artwork that celebrates the City of St Petersburg and Tampa Bay, Florida. The Sand Glow Sculpture has seventeen artworks and was designed to illuminate the atrium staircase. Twenty-nine large format works were selected for three walls on the atrium's second floor. Robert's artwork is the first impression for all who visit the office building. Each artwork uses a high density, high quality print on acrylic. The interior designer selected the palette and was the driving factor to determine color selection. Each artwork is signed and is the Artist Proof, except for two artworks noted. Each work has a three inch border and is mounted with four brushed standoffs. Sand flowing across the atrium staircase. The warm colors of the palette soothe the space and the backlit design can be seen from the street. Robert combines his photography and 3D objects to leverage design for the public are. Four artworks were selected. Local icons from St. Petersburg, Florida. Five artworks were selected. Features specific icons of national prominence. Five artworks were selected. The health care theme has six artworks selected. The artwork reflect the core theme that define the project. Nine artworks were selected.